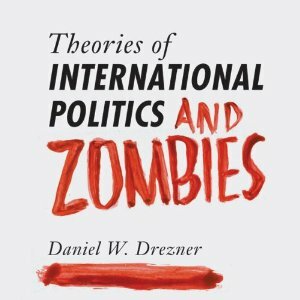 Theories of International Politics and Zombies by Daniel W. Drezner: The appearance of zombies is the ultimate The Black Swan effect. No one can predict exactly how we will respond to them but Drezner does an excellent job in assessing how the most popular theories of international politics would be used to form government policy. The book covers pragmatism (realpolitik), liberalism, neo-conservative ideology and social construction theory to describe broad goals and reactions from the various power groups in government. Neo-conservatives, for example, might conflate the threat represented by an undead horde with the pre-existing ‘axis of evil’ and try to link rogue nation states with zombies. Liberals, of course, would at least consider the rights of the undead. The book also describes possible responses in domestic policy, bureaucratic politics and the psychological reaction in the public at large. Given that several dozen government agencies deal with bioterrorism, how many would become involved in a zombie-related crisis? Furthermore our own cognitive biases could hinder our ability to effectively deal with hordes of zombies. 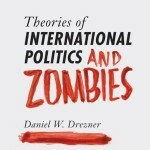 Theories of International Politics and Zombies is an excellent and quick read. It weighs in at 153 pages (the last 39 pages being acknowledgments, notes, references and a thorough glossary) so it can be easily devoured in a few hours. Unlike most books on political theory, the text is clear and concise, explaining how theory can be applied to the undead without being abstruse. Even if you aren’t a fan of the undead, this book provides a good primer to several dominant political theories by showing how they function in a crisis.